Welcome to this week’s edition of The Friday Five! The Friday Five is a feature that I post every Friday in which I give my thoughts on a topic that’s related to NBA Live, NBA 2K, and other basketball video games, as well as the real NBA, and other areas of interest to our community. The feature is presented as either a list of five items, or in the form of a Top 5 countdown. This week’s Five offers five tips for earning and managing VC in NBA 2K19’s MyCAREER. Fighting the urge to buy VC to level up faster in NBA 2K19’s MyCAREER? You’re not alone, as the game is designed to push you in the direction of microtransactions. Since the situation is unlikely to get better anytime soon, I’ve decided that it would be more productive to focus on some content that helps gamers rather than critiques 2K’s design choices. After all, while microtransactions are strongly encouraged, VC can indeed be gained without spending real money. With that in mind, I’ve devised five tips that I hope will be useful for both earning and managing VC. Before I get to the tips, I should emphasise that it’s still going to be a long process. As the push for recurrent revenue is quite aggressive, the grind is very real. Perseverance will pay off, however. Aside from the pre-order bonus for the standard edition, I’ve not spent any VC that I didn’t earn in-game, and as of this writing, I’m sitting at 74 Overall (starting from the base rating of 60). I did skip The Prelude for this player, though as a bonus tip, I would suggest that you play through it in order to get a head start on upgrades and Badges, as well as an opportunity for a higher salary out of the gate. With that being said, let’s take a look at some strategies for VC budgeting! To begin with, you want to maximise your earnings when you reach the NBA in this year’s MyCAREER. We have the ability to negotiate our first contract, so it’s vital that you look out for your best interests as you make the deal. I started a new player after completing The Prelude as I wanted a different Archetype, and since I’d chosen to skip it, the best offers were all slightly lower. I also made the mistake of taking less VC in exchange for a 2x MyPOINTS multiplier. This is something I was advised to do at the time, but I regret it now. Cap breakers still take a long time to hit, and early on it’s better to have more VC. Of course, if you can get a good deal on both, go for it. After that, you’ll have an opportunity to negotiate endorsement deals, which all have their own incentives. It’s tempting to pick the biggest payouts here, but they’re only valuable if you can reach those incentives every game. For example, I’m currently averaging 26 ppg and 12 apg on the season, though as of late it’s been closer to around 30 and 15. As such, I’ve chosen incentives that pay out when I get double-doubles, as well as specific combinations of points and assists I’m likely to get. Certain incentives may pay more, but are tougher to hit consistently as a Sharpshooting Playmaker. On every negotiation, pick the incentives that you can easily reach time and time again. It may sound like very obvious advice, but it needs to be said. If you want to avoid buying VC, you must be doing absolutely everything you can to earn it in-game. That means playing often, putting up big numbers and reaching your incentives, getting a good teammate grade to add to your base salary, gaining fans for more lucrative deals with your endorsements, and occasionally sacrificing team chemistry to plug products in post-game press conferences (you can easily get it back through wins and training). You also need to take advantage of every other avenue that MyCAREER provides to earn VC. Even if it’s a small amount, it all adds up when you’re constantly grinding. Do the Daily Spin; you may get VC, or you may gain fans which push you closer to being able to negotiate bigger endorsement contracts. While you’re in that building, play Daily Pick ‘Em. It’s only 100 VC per correct answer, but it’s a decent earning if you can regularly pick winners on NBA games. Shoot around in your MyCOURT, as performing certain actions (hit three three-pointers in a row, dunk in each basket, etc) will earn small amounts of VC. Complete daily goals when VC is up for grabs. Take part in Neighborhood games for VC prizes, as well as the daily Trivia for a shot at some huge jackpots. Seriously, do it all, and do it as often as you can. This will also sound like I’m stating the obvious here, but it’s really easy to get drawn into spending VC on other things in MyCAREER. The reason we always start the mode with the same brown t-shirt and grey sweatpants is to encourage us to buy some new clothes so that we don’t look like a noob in The Playground. That cuts into the budget and encourages microtransactions, but we’re trying to avoid that. To that end, forego vanity and customisation. 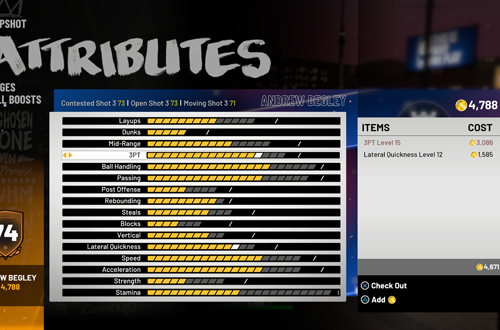 Until you’ve hit the ratings cap, or are otherwise loaded with VC, just stick to updating your attributes. Everything else can wait, as it will not make your player any better on the virtual hardwood (or blacktop). The same goes for animations. Leave those fancy dunk and dribbling packages until your attributes have increased, and you’ve got a little extra to spend. Fortunately, the basic jumpshot and free throw animations are all free this year. Also, if you do feel you need new clothing and gear, the aforementioned Daily Spin can help out. 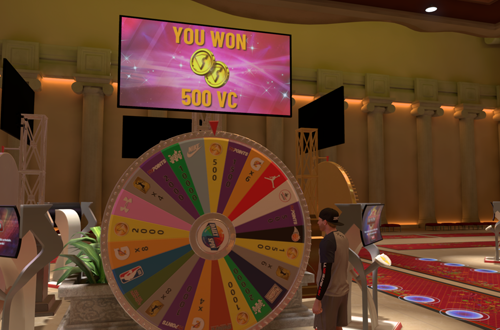 While VC is the best prize of all, the wheel can also help you save it by rewarding you with shoes, t-shirts, hats, on-court accessories, and so on. There’s also a free pair of grey basketball shorts available in Swag’s. They may not be your first choice, but you’ll at least look less generic as you play through MyCAREER and the connected modes. Just because you’ve got some VC to spend and plenty of attribute upgrades to buy, it doesn’t mean you have to make a purchase right away. While we tend to prioritise key attributes early on, as they get more and more expensive, it’s easy to fall into the trap of spending whatever you have on hand on whatever you can currently afford. This often results in upgrading attributes that are less vital to your Archetype and playing style, wasting savings that could be accumulating for far more important upgrades. It’s not worth the minimal push to hit the next Overall Rating point, especially when you reach the mid 70s and getting to the next level costs around 10,000 VC. If you’re playing the connected online modes in MyCAREER, it’s really important that you focus on your key attributes and athletic ratings. You’re going to be facing gamers who either took advantage of the pay-to-win mechanics or have been grinding hard, so while you catch up, make sure that you’re upgrading your athleticism and key skills. If that means holding off on buying any attribute grades until you have several thousand VC banked, so be it. If you’re a point guard that doesn’t post up, leave those attributes until last. The same goes for a rebounding Archetype and a category such as steals. Hold onto your VC, and then buy in bulk. Should you find yourself getting impatient with your earnings (or lack thereof), you may want to consider starting a second MyCAREER game. Now, that may seem counter-intuitive when you’re already trying to grind up one player, but it can be a viable second “income”. 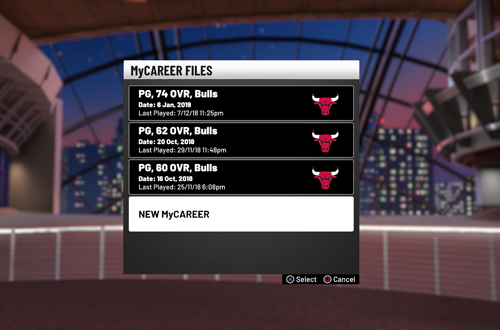 I’d only recommend doing this after you’ve put a fair amount of time into one player and have been able to grind up your Badges, because at that point you can afford to split time with a second MyCAREER. Basically, this second player is going to be a throwaway. It doesn’t matter what your stats are; you’re just using them for their base salary, which should be the highest you can get. What you’re aiming to do here is to get through some games quickly in order to boost your funds. That’s easier to do with a new player who is getting less court time, and is even more efficient if you’re playing five minute quarters. Contrary to an exploit at launch that has been patched, you will be playing games, so there’s still a legitimate grind. They’re just going to be over quicker than games with your star player that is now playing 30+ minutes. Play a few games every so often with this second player and just funnel all of the VC into your primary MyCAREER. It’s also a chance to try out another Archetype, and otherwise mess around in a low-stakes setting. 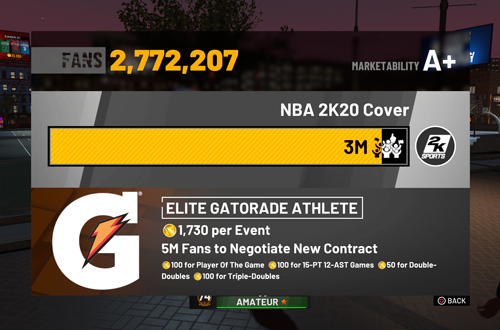 Do you have any tips for earning VC in MyCAREER and the connected experiences through legitimate grinding? Feel free to share them in the comments below, as well as over in the NLSC Forum! That’s all for this week, so thanks for checking in, have a great weekend, and please join me again next Friday for another Five. When I’m not swimming in VC, I typically just upgrade the next cheapest attribute. The one thing I fucked up on was Nike wanted me to wear their shoes… fine. I didn’t realize I had to wear them at the Playground as well! I didn’t realize the game was that smart. Subsequently, they dropped me. I was doing that too – upgrading whatever I could afford, even if it wasn’t a key skill – but I’ve recently taken to saving VC and focusing on the attributes that are most important to my Archetype and style. Another reason I do that is because reaching the next level of Overall Rating depends on how much VC you spend, rather than the attributes you’re upgrading. For example, at my current level, it’s costing around 8000-10,000 VC to get to the next level. To that end, it doesn’t matter what you’re putting the VC into, just that you spend that much worth of upgrades. In other words, three upgrades that cost a total of 8000-10,000 will get you to the next level, while six upgrades that fall short of that required total will not. Again, a sign of how microtransactions are strongly encouraged, as it’s about the spend and not the calculation of the ratings. Yeah, the shoe deal is pretty harsh. I’ve been caught out with warnings in previous games when I’ve forgotten to change shoes. Having to buy shoes for every mode is also another way of pushing microtransactions (as I discussed last week), but I got lucky with the Daily Spin and won some Jordan brand shoes for every connected mode. 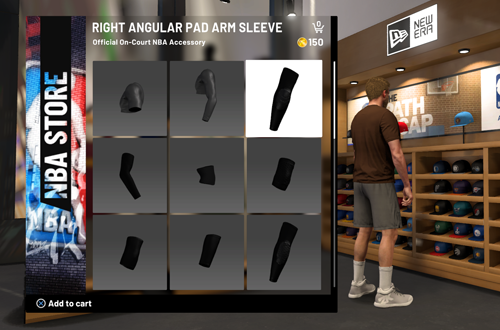 That’s why I recommend doing the Spin, because even if you don’t get VC, you can get stuff that comes in handy, either making your player look less generic or getting you some shoes that satisfy your brand deal without having to spend VC on them.